Hall 3 of the Uffizi Gallery hosts two new works: two paintings depicting the Saints Peter and John the Baptist by the Sienese painter Bartolomeo Bulgarini. Two predellas, in which an Apostle and St. Paul are depicted, complete the works. Before being exposed, the works have been restored thanks to CRALT Group Telecom Italy - Tuscany and Liguria. Rita Alzeni and Roberto Buda out the work under the direction of Daniela Parenti, director of the department of the Middle Ages and early Renaissance paintings of the Uffizi Gallery. Bulgarini was an important master of the Sienese school of painting, but he was not present at the in the gallery. He lived between 1315 and 1378, and now enters the group of the Uffizi artists. Its two works were part of a larger work, now dismembered. Other parts of the altarpiece are still in Siena. In his hometown Bulgarini had an important workshop. 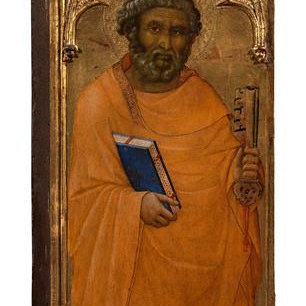 According to Vasari he was a pupil of Pietro Lorenzetti, but probably he also studied with Duccio.